This ham and bean soup recipe creates a low calorie meal that is rich in protein, fiber and nutrients. You don’t have to wait for a cold winter’s day to enjoy a bowl. You can use either canned or dried beans from a package, whichever you enjoy using the most. The recipe below outlines using both canned and dried for your convenience. In a large soup pot add olive oil, onions, garlic, paprika, bay leaf and all vegetables except the kidney beans. Turn heat to medium high and sauté for about 7 – 10 minutes until veggies are softened. Add broth, water and beans, turn heat on high and bring all ingredients to a boil, then reduce heat and simmer for 15 minutes or until vegetables are tender. Remove from heat. 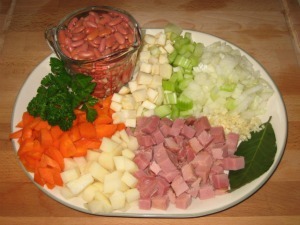 Now that the veggies are cooked add the cubed ham and salt and pepper to taste. 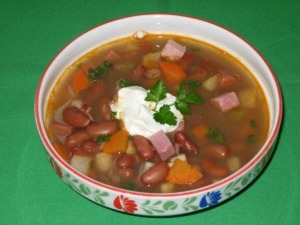 This hearty bowl of ham and bean soup can be garnished nicely by adding a dollop of sour cream sprinkled with parsley or chopped green onions. If you don’t have any ham broth available you can substitute it with water or another type of broth of your choice. If you prefer using dried beans instead of canned then you must prepare the beans first. Soak one cup of dried red kidney beans overnight, then rinse and drain. Place beans in a pot and cover at least 2 inches above with water, bring to a boil, then reduce heat and simmer for 45 minutes to 1 hour until cooked. Check package for cooking times as some beans may vary. Now these are ready to use just like the canned variety. Fill your belly up with this low calorie meal that is rich with fiber, protein and nutrients. It’s so diet friendly and at the same time tasty and filling.